The annual matchup between the University of Washington and Washington State University is history. This year, the Dawgs won 30-0. The Cougars never got the ball closer than the Husky 33-yard line. Amazing. Yet, this was a recovering Husky team (recovering from last year’s 0-12 season, the first and only in school history) and a banged-up Cougar team that was this close to putting Bob Robertson in as quarterback. 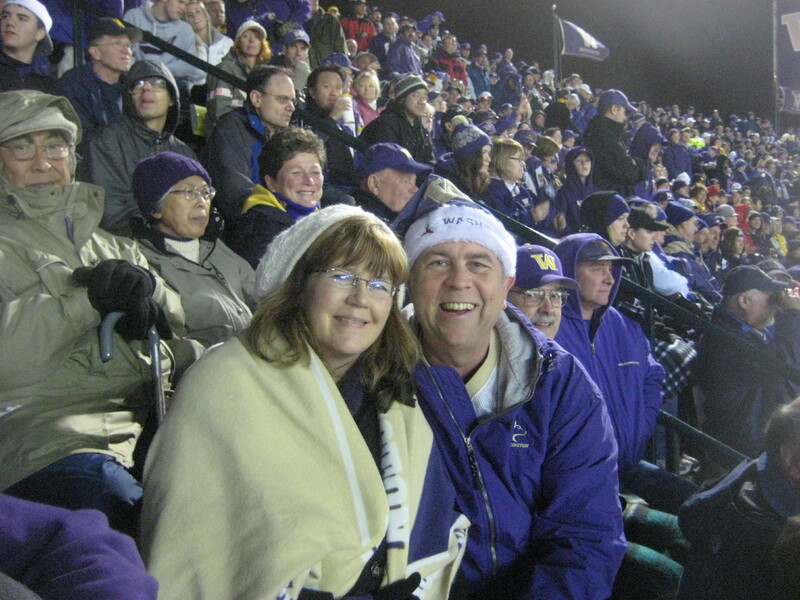 The crowd around us showed occasional Apple Cup spirit, but for the most part, acted like they were at a kid’s dance recital. Some occasional cheers for the great plays, the rest of the time, just observing. The game gave me hope for a better year next year (“better” being code for a bowl game). The UW played like they could have played all season. Let down games will happen, but there were at least two where we played good enough to win and just let down at at key moments. Fix that, make sure Locker (if he comes back) gets guys that can consistently catch the ball, and 2010 just might be that season I’ve been waiting for every since Don James hung up his purple tie. Thanks Coach Sark for giving us the hope that this program could almost be turned around. Now, those two very important words: next year!